Product Owners: are you making the mistake of telling your team how to do something rather than just what you’d like done? Are you open to product ideas from all sources? Managers: If an employee comes to you with a suggestion, are you willing to help them turn it into an experiment and examine the results together, or will you argue with them based only on your conjectures? This is fundamental. Modern software development—particularly at large —corporations—is complex, not complicated. Therefore there is always uncertainty. There will always be things that we do not know. If we cannot create the safety for individuals and teams to acknowledge this, they may not come to learn. Basic project management measurement is variance from plan. So say you vary from plan. What happens? Oh, you’ve got a performance failure, right? Maybe. There is another way to look at performance from schedule. Perhaps it’s not the person who’s trying to manage the schedules fault. Perhaps it’s the schedule’s fault instead. In fact, if the schedule is a hypothesis rolled up from a lot of detail, it’s the schedule’s fault, not the person’s fault and what we really should do is view it as a learning opportunity. Guess what? We’ve learned something about our capability to schedule and we have to rethink how we’re going to schedule because this particular one wasn’t correct. We came up with a wrong hypothesis. What is it about our scheduling approach that gives us wrong hypotheses? In this case, it is the manager that accepts the knee-jerk explanation that a human being is to blame, punishes them, and concludes their inquiry. They wholly miss the opportunity to learn. This reminds me a little bit of the first line of the Agile Manifesto: “Individuals and interactions over processes and tools.” It also reminds me of my fellow coach Monica Yap reminding me to think of how to make things effective (total systemic, long-term efficiency) rather than merely efficient (local and short-term). At first it doesn’t seem like software companies could have a problem with safety. After all, there are many physical hazards in a factory that don’t exist in an office environment. However, we see safety violations all the time if we broaden the term to include any event that could harm the employee, compromise performance, and embarrass the company. Surely the recent allegations of sexual harassment at Uber point to a company that was unable to create safety for all of its employees. A more prevalent example is muri, the waste of overburden. Yes, stress compromises performance. But it also harms employees and embarrasses the company. I recall once politely asking a group of managers to exit a conference room our team had reserved for a team meeting and receiving a totally serious reply of “there are more of us than there are of you.” Our team was forced to find another room, utterly demoralized. Thanks for reading my commentary. I hope you’ll check out the rest of the handbook and share your insights with us. Thanks for linking to me. I’m glad you were able to get the whole handbook scanned. That’s good to know I can request documents remotely if there’s anything I want to follow up on. That scan is better (and more complete) than my iPhone photos. Mark, glad you liked it! I believe that they normally they charge for the scans and use fees, so it was a really kind favor of them. Nice article, Chris, and it was great to see a PDF of the handbook. It brings me back to 1984 – I was working then – a time when companies were not yet so infected with the shareholder value nonsense that took over most US industries shortly thereafter. Mary, I’m so delighted to hear from you on my blog. I am glad you enjoyed seeing the handbook. I do not have your tenure so I can only imagine such a time. Perhaps the Certified B Corporation movement will do a little bit of good. Thank you for being such a thought leader in the field. I have learned so much from you. 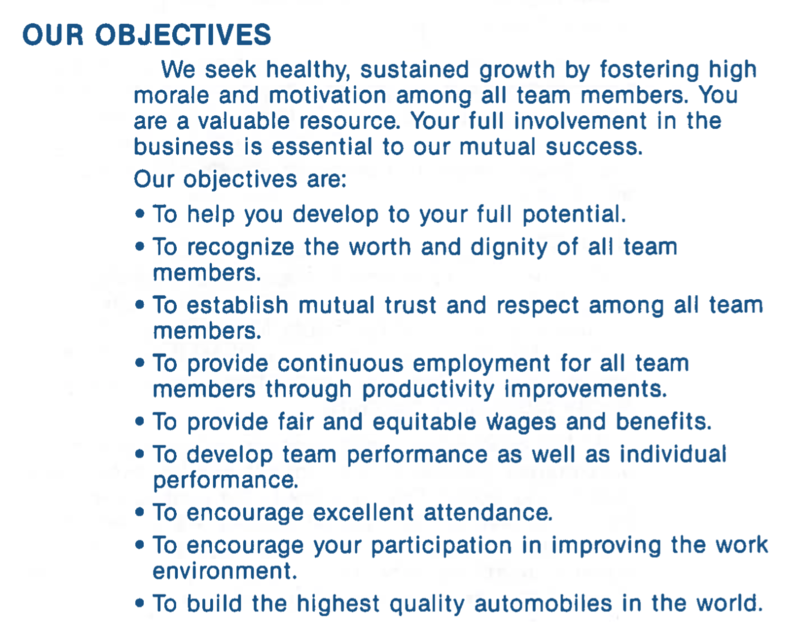 ✦ NUMMI management made themselves accountable by sharing their philosophy and beliefs in a written document. I have more insights but my time box has expired. Thank you for sharing the handbook, Chris! In all seriousness though, I’d love to see Elon’s strategy.